Tired of playing phone tag with your crew? When you’re running a business things can change on the fly. Our latest mobile app update automatically keeps your crew in the loop, so you don’t have to—push notifications are now here! 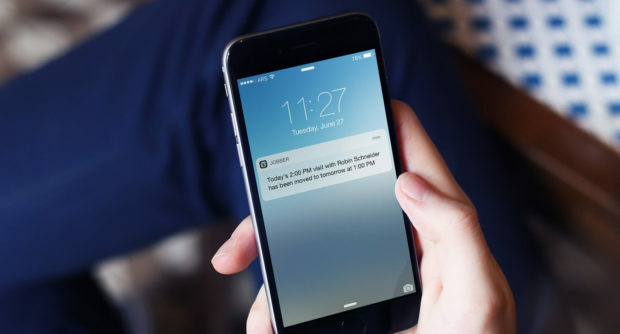 Immediately alert your team to schedule changes with push notifications that pop up on their phones from the Jobber app. They’ll get a notification in the field whenever they have a schedule change that affects their current work day. Whether your client called to cancel, one of your crews is running late from their last job and you need to reassign the work, or you were able to squeeze in a new last-minute job—your team is in the loop and you can rest easy knowing they’ll show up to the right job at the right time. We’re always making improvements to our mobile app to help your team work better in the field. Don’t miss out on our regular updates—keep your Jobber mobile app up-to-date. Install or update your Jobber mobile app now from the App Store, or Google Play. You can also learn more about Jobber’s scheduling and drag-and-drop calendar features.